We sold approximately 133m tokens to our pre-cleared purchasers and received 14,000 ETH in this public sale. We had 14,300 customers buy our tokens and we are so very appreciative of your belief in the power of securing the IoT with the Atonomi Network. 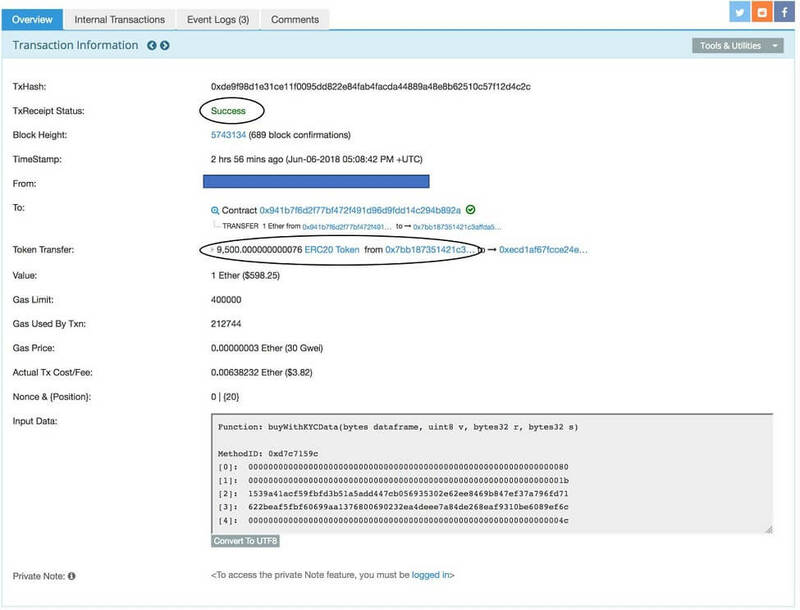 To check if your transaction was successful, you can confirm by searching your transaction ID on EtherScan. There you can look for the "Success" status indicator. Also, to see how many ATMI tokens you purchased, look at the circled field. The tokens are delivered to the public sale wallets but are not in their control until we complete security and fraud screening. We anticipate that the Atonomi tokens purchased will be delivered/available within approximately four weeks. We have requested that the MEW and MetaMask wallets, among others, recognize the ATMI token so you can see them visibly in the wallet. Updates will be provided and instructions will follow for other wallets as well. As a confirmation for your participation you likely already received an email in your registered whitelisted email address that was used to participate in the token sale. Please check your spam folder as well. The email comes from the address no-reply@communications.tokenmarket.net. We will continue to provide updates on our blog and Telegram channels. CAUTION: Scammers frequently send e-mails and messages after the close of an ICO claiming that the sale has been re-opened, and providing their own address for submissions.